The United States Aquatic Sports, which includes USMS as a member, held its annual convention in Greensboro Sept 12-16. There was some great news for our LMSC at the Convention. First of all, VMST was chosen to host the 2013 Long Course Colonies Zone Championship! Mark your calendars: the meet will be held June 22-23 in Richmond at the GRAP Collegiate School Aquatics Center. This facility houses the same pool that was used in Omaha for the 2008 US Olympic Trials. Swim in the same pool that launched Michael Phelps’ 8-gold-medal performance in 2008! Safe to say the waters will be churning with some fast swimming. 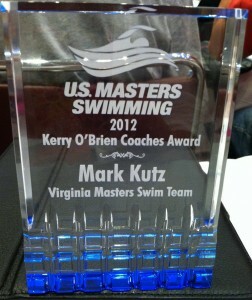 And VMST’s Mark Kutz won a Kerry O’Brien coaching award! Originally named the Grass Roots Coaching Award, it recognizes coaches who are building masters swimming communities throughout the country. Mark coaches a tight-knit group of masters swimmers at the NOVA Aquatics Center in Richmond. Congratulations, Mark, on a well-deserved honor! The Virginia LMSC sent four delegates to the meeting, and they were joined by 5 other LMSC members who were there in other capacities. There were many public committee meetings, discussions of strategic goals, officer elections, and the House of Delegates met to debate proposed rule changes and to approve the 2013 budget. A number of useful workshops were also offered. Many of the main events are described on the USMS website, and in the committee meeting minutes. A new USMS promotional video (below) was shown to the HOD for the first time. Many of the proposed rule changes were also approved; Rules Committee chair Kathy Casey has summarized the most important changes and these are listed below the video. Eliminated the option of swimming two-to-a-lane in freestyle events over 200 meters. The rule requiring a line marking the midpoint of a long course pool has been deleted.